Apple’s share increased from 17.1% to 18.5% over the three-month period, giving it an addition 1.4 percentage points, according to the latest data from comScore. That’s just a little more than the 1.2 percentage points Samsung gained during the same time. Between them, they’ve collected 2.6 percentage points. If both companies are growing, it can only mean one thing — their competitors are the ones who are getting hit. LG, Motorola, and HTC make up the top five smartphone vendors in the U.S., but not one of them saw any growth. LG sits in third place with 17.5% of the market, a 0.7% drop over the 18.2% it held during the last three-month period. Motorola’s in fourth with 10.4% — a 0.8% drop over its previous 11.2%; while HTC’s in fifth with 5.9% — a 0.4% drop of its previous 6.3%. Apple overtook LG just last month, largely thanks to the overwhelming demand seen for its iPhone 5, and it appears as if the Cupertino company is going to hold onto second place for the foreseeable future. LG could have a chance to reclaim the spot with its hugely popular Nexus 4, but it appears the company simply cannot produce them fast enough. 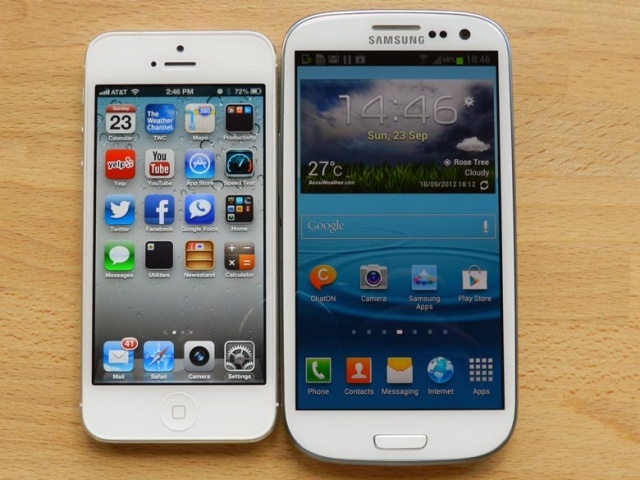 Apple also sits in second place when it comes to smartphone platforms. Its iOS operating system gained 0.7 percentage points over the three months, giving it a 35% share of the market. Android has first place in the bag with more than half (53.7%) of the market share; it gained 1.1 percentage points. RIM’s BlackBerry OS, Microsoft’s Windows Phone, and Symbian, which sit in third, fourth, and fifth place respectively, all dropped percentage points. RIM was the biggest loser, seeing its share drop 1 percentage point from 8.3% to 7.3%.